Join local artist Jessica Vergeer at Trestle Brewing Company for Paint the Bridge: Brewery Brunch and Brush February 24th from 10:00 am until 1:30 pm. The event starts at 10:00 am sharp for brunch in the Trestle Taproom. You’ll get to enjoy a delicious brunch while taking in the view of what you’re about to paint! 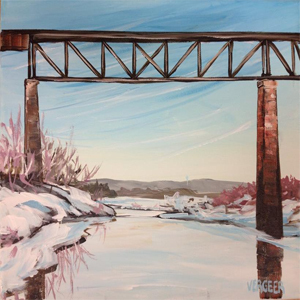 You’ll then head into a painting class with local artist Jessica Vergeer who will walk you through the process of creating an 11×14 acrylic landscape painting of a winter scene of the Trestle, step-by-step, from start to finish. You will leave this class with your finished painting! No painting experience is required. What is required is a good sense of humour and a willingness to meet new people, have fun and get your hands a little dirty! Registration is limited to 20 participants so register now to avoid disappointment! For complete details please follow the link provided above.